There are few situations in video development process when we are not interested to show face of the actor in final clip. It might be due to safety or personal issues where just information is required to be transferred instead of focusing on face of the person. If you are also working on similar kind of project but are not able to execute this blurring task effectively then you are on right page. Wondershare Filmora can help you to execute the Blur function with ease that is why this platform is loved by most of beginners as well as professionals. Users simply need to highlight their target clip on timelines and then right click for selection of power tool. Access Face Off option from pop up window and then select “Apply Face Off to the Clip”. Select first mosaic effect and it will be implemented on selected face. In case if you want to have more fun with video clip then wondershare provide easy access to many funny marks. Once your editing task is complete then preview your clip by using Play button and finally Save your project. It can be easily uploaded on various platforms after editing. Choose your recently create node, move to Window palette and then enable mask for objects that you want to blur in current footage. Linear: It is a four point structure that can be edited to form trapezoid or rectangle as per need. Circular: This oval shape can be adjusted to serve for many problems. Polygonal: Another point shape that can be expended further to create sharp cornered complex polygonal shapes. Power Curve: It is an advanced drawing tool for development of unique shapes with polygon, curved or mixed kind of appearance. Gradient: Here is a two handled control that can divide screen into two parts with easy adjustment options. Once you have adjusted the mask, then it is right time to use Tracker Palette. This tracker palette use to have three different modes: FX mode, Stabilizer and Window mode. The tracking controls can be used to match window motions. You will be able to access an advanced 3D cloud tracker on DVR window that assists in highly accurate and fast tracking functions on almost all power windows. It can be used to adjust any kind of feature and users need not to spend time on manual adjustments of window positing. It is time to select your clip; ensure that you are at beginning part of this footage. Now start analyzing your footage and track those selected objects backward or forward using marker available on screen. Once you are done with this analysis, then it is good to move towards next step. The blur palette usually comes with three unique modes: mist, sharpen and blur. Although, functionality of sharpen and blur overlap but still they are capable enough to work for unique controls on clip. Radius: It is considered as ideal control for sharpening and blurring tasks. Its default value use to be 0.50 and it will never show any specific effect on your footage whereas if you raise the radius slider then blur can be increased. Generally, a softer setting is achieved t 6.00 level. If you lower down your radius then sharpness can be easily increased; its minimum value can be 0.00. H/V Ratio: This tool assists editors to set directionality of current operations. Its default value use to be 0.50 and with this setting, image suffers equal effects for vertical as well as horizontal direction. In case if you raise H/V ratio then its effect will directly reflect changes on horizontal axis whereas reduction of H/V ratio below default value will cause direct effect on vertical axis. You will be able to find a set of ResolveFX filters on DVR window. They are situated inside OpenFX Browser and show effect same as other OpenFX plug-ins. ResolveFX filter is often of two types: CPU based, and GPU accelerated ones. Box Blur: It is a variable quality blur where number of iterations will decide smoothness of blur. 1 is the lowest value for this adjustment whereas you can go up to 6 on higher side of scale. 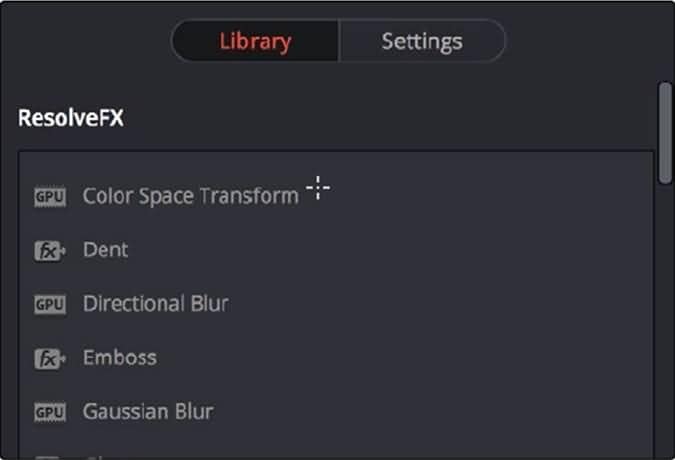 Use horizontal and vertical sliders to make settings for height and width of blur whereas the gang checkbox can adjust all parameters simultaneously. Adjust edges using Border types. Gaussian Blur: As the name reflects, the two sliders on can used to adjust vertical and horizontal strengths on separately whereas gang checkbox can be accessed for simultaneous controls. Mosaic Blur: This pixelated blur if best if you want to hide a face completely as its pixel frequency will help you to adjust all pixel dimensions for proper resolution and density. How to Use Multicam Editing in DaVinci Resolve?